To view our PDF guide to the considerable benefits of subscribing to The Good Lawyer Guide, click here. Those outstanding statistics are the reason why we are able to send out dozens of business leads every week. Subscribing to the site gives your firm the chance to make the most of their recommendation. Subscriber firms are listed above non-subscribers in our recommendations, so you will always be first on display to clients in any search. Lawyers at subscriber firms are guaranteed inclusion on any relevant fee quote request forms. So if a client is looking for a local expert in your field - they will be given your name as a matter of course. Enhanced listing: display extended, full colour profiles of your lawyers and the firm as a whole; including comprehensive contact info, firm logos and branding, links to latest updates and even add brochures or social networking feeds to your pages. Have a look at our PDF guide for more information! We offer banner advertising, using the rotating banner ads on the right hand side of each Good Lawyer Guide page. 1000s of visitors search our pages every day. Your ad can be made to link through to any page you like on your own website - or even to your Good Lawyer Guide profile if so desired. Not only that, but our production team can design and animate your ad to YOUR specification - at no extra cost. For instance, a personal injury firm might buy a banner ad that displays whenever a user searches for an ‘Accident claims’ or Medical accidents’ lawyer in any of a selected number of postcodes or town locations. A conveyancer might buy a banner ad that displays when a user searches for ‘Buying a house or flat’ in a specific town. You can select as many – or as few - work categories and postcodes, as is appropriate for your firm. We offer a range of banner advertising packages to suit all firms and business plans, at extremely competitive rates. Contact us now for a bespoke quote based on your requirements. Use the Questions asked by Good Lawyer Guide users as a free way of marketing your expertise to a wide audience of potential clients. Your Answers will be credited to you (with your name appearing, and a link to your profile). In addition, your profile will list all answers you have given, and you may be featured on our Home Page as a Q&A contributor - all helping increase your presence on the Good Lawyer Guide. Add our logo to your own website to show your firm is endorsed by The Good Lawyer Guide. Logo doesn't match your site's design? Click here for some alternative versions that may offer the look you want! 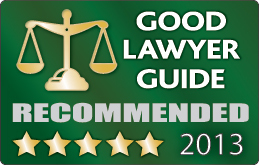 If you have been recommended by The Good Lawyer Guide - link through to that recommendation directly from your own website. Alternatively, if you have answered a question in our legal advice forum and would like your clients to know you are a Expert contributor, use the logo below to link to the answer you gave to help out one of our visitors.